The dog is adorable! 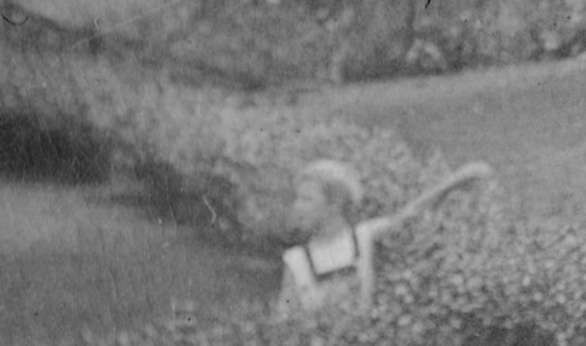 And I have pics of my father as a little kid in the early 1920’s with his girl cousin – she’s wearing a similar bow in her hair. Looks like teens or 20s, maybe on the prairie somewhere. Tidy house & yard — appears to be an outbuilding in the act of tumbling down behind the house. I love the funny dog. The kid in the hedge looks like he’s saying, “Hey Dad, look! They are taking a PHOTOGRAPH next door!” Cool folks. I’ve been looking at that little “shack”— could it be a quilt drying on a line? Could be earlier based on length of dresses. If only the flag were not wrapped around the pole, we could count the stars. You’re amazing. How did you spot the child in the bushes? Enjoy your break. I didn’t see him at first but I always zoom in to make sure I do not miss anything when doing the cropped sections. The farmhouse looks like it could be from a plan book design. (Palliser Bros. or Shoppell?) From the surrounding terrain, the house appears to be located in one of the Plains states…Nebraska, Kansas, or Iowa, perhaps? Everyone posing for the photo appears to be dressed in their Sunday best. I’ve been looking for listing near Brighton, UK (southern coast of England). – 1929 Grade II Listed ‘Tudor style’ 3BR end terrace, £750,000: https://www.zoopla.co.uk/for-sale/details/49190496?search_identifier=238bf31c9116f841fac5c0cccd82ba4d –> like the above, beams, woodfloors, looks older than it is. – 5 BR detached house, £1,750,000: https://www.zoopla.co.uk/for-sale/details/49419828?search_identifier=409d16a120c5c2f15a1b52e2d6a432ce –> I find it elegantly decorated and wanted to share it with you. I love the Tudor house too. You have to gasp at the first photo, of its front; it’s so beautiful. They’ve done a great job of making the place warm & welcoming and given it a feeling of light, which is often a challenge in houses of that period. Stunning! What a pleasure to see and dream about. Many thanks for posting! 1913 Historic Italianate Style home in Boston-Edison Neighborhood, Detroit, MI. $575,000. Wow! Everything about this Italian Renaissance Revival exudes wealth and luxury. The house dates from the time when Detroit was the automotive capital of the world. I believe the Boston-Edison neighborhood has never experienced the kind of extreme decline that some other Motor City neighborhoods have gone through. Among the luxury items noted is a rare rib-cage shower and it appears to be complete and functional. Beautiful woodwork and art glass complete the luxurious surroundings. Thanks for sharing. That is one beautiful house! My fave of the batch of the third house. Sitting on the porch on a warm afternoon overlooking the river, with a book, snack, and/or glass of wine, and maybe falling asleep… mmm… Very relaxing looking. The last place is heaven as long as somebody else does the upkeep and cleaning. Fabulous property and the quintessential St. Lawrence summer house. If I ever have another life, I’d like it to be here. I’d settle for a week off and a Holiday Inn Express, but it’s fun to dream. Thanks for posting. I love the Findley Lake area! I used to drive past this house all the time. I never knew it was so nice inside. I could live here-in the spring, summer, and fall. Unfortunately, there’s no supermarkets here, besides a convenience store. I think you’d have to go into Sherman for a small grocery store, and either further down the road to Lakeview, or the other way, to Erie, Pa. But, Findley Lake is close to many things you’d want to do while vacationing, or spending the summer here. There’s some nice little boutiques in town, and some nice restaurant/bars, and of course swimming, sailing, and fishing on the lake. Peek n’ Peak is just down the road-this is a 4 season resort that has grown a ton since it stArted. There are now a lot of condos around the resort for rent or sale. The the Great Blue Heron Music Festival is in nearby Sherman every 4th of July weekend, a nice one that people of all ages can attend, for roots, Celtic, and zydeco music, plus activities for the kids, crafts and food vendors. Well worth dropping in for. I go for at least one day. Every year. Found this on craigslist… who knew there was such a thing as a gorgeous hot water tank?! I love so many things about this photo. The fact that they’re all sitting on the grass in front of a sign saying keep off the grass. The mysterious child out in the grass. The odd collapsing tent in the back. And whooops, you’re missing some bricks in that chimney. I would love to know what exterior colors the exterior is. What did the kid in the bushes do to get excluded from the rest? Kinda reminds me of a Wyeth painting. My own guess about the tent… That the kids used it for ‘camping out in the backyard’ nights. My mom, a city girl, said on hot nights they would all sleep out in the yard. Everyone had folding camp cots but the kids often slept on sheets spread on the ground. Mine grew up in Nebraska, where on hot nights they wet a sheet and slept rolled up in it on the grass. 1) 1928, $220,000; Center hall Dutch colonial revival, ‘normal’ sized house, cute, & (IMO) nicely decorated. I’d even keep most of the paint colors as they are. 2) 1930, $699,000; large colonial revival, alcoves & window seats, various types of built-ins, etc. I’m personally okay with the kitchen, except that I’d have to change the backsplash. 4) 1930, $2,730,000 Park Slope; posted because of its exterior, lobby, and gorgeous living room. Floor plan. The ‘1920’ Brownstone is more like 50 years older, with beautiful woodwork, and the architecture of the second Park Slope home (both, really) is beautiful, in and out. Just me, but the modern decor in these types of homes drives me batty. I was thinking the same thing. The light fixtures especially. But at least they didn’t tear out or paint the beautiful wainscothing, paneling and a lot of the beautiful carved woodwork. Decor comes and goes; as long as it doesn’t irreversibly impact a building’s architectural integrity I couldn’t care less how people decorate or furnish their homes. What I find more objectionable is that on a property priced at nearly four million dollars the realtor doesn’t take the time to ascertain the correct age of the property. An obvious miss of nearly half a century is just plain sloppy. Even if you aren’t adept at connecting architectural styles with specific time frames, a few minutes online will tell you that a previous property owner, former New York mayor William Gaynor, died in 1913, so clearly the house pre-dates his demise. Sloppy. For me, what is much worse is the second house cut up into condos. The unit offered includes the parlor and main bedroom floors. Agreed… no matter how “sensitively” a conversion to condos is done, the architectural integrity is irreversibly compromised and is never coming back. You certainly hit the nail on the head with the variety of stylistic influences on display in this house. Still, it offers a lot of space and seems to have adequate natural light with the large windows. Not for a purist, as you say, but it might be the perfect house for a creative new owner with an adequate budget to complete their vision for this house. Might be helpful to seek input from an architect to help unify the house around a theme-the results could be amazing, IMO. Thanks for sharing. Needs somebody with a lot of TLC. Looks like there was a fire in that one section with the arched windows. Ceiling and the walls look scorched. Beautiful house. The first several pictures are hard to get a grasp on with the current owners stuff. Remove that, and I would be able to see how much beauty is still there! Lots of work, but so many possibilities! The kitchen is barely functional (just enough to allow for occupancy) but easily a blank slate to do it right. Hi all—two to share today. First up is a 1739 Colonial in Morris Ct, listed at $260,000. As you can see, much original detail remains. The price has dropped drastically over the last year that it’s been on the market because unfortunately, a Dollar General was built next door to it. It really isn’t so bad, but I feel for the owners. It’s still feels pretty private. The second house is a 1779 Colonial in Watertown, Ct listed at $225,000. I strongly suspect the portico of being a 1946 addition (The listing states the home was restored in 1946) since the house at first glance almost appears to be a Colonial Revival. The house retains a lot of beautiful paneling, but an unfortunate bath remodel will need to be redone. Regards to Morris CT home, Dollar General well screened. Glad to see that. It’s a wonderful wonderful house. In a very pretty part of the state. I like both of these, but the second is my first choice. It seems to have a bit more “old” to it, and I love all the carefully patched floors. Yeah, I know. I’m weird. 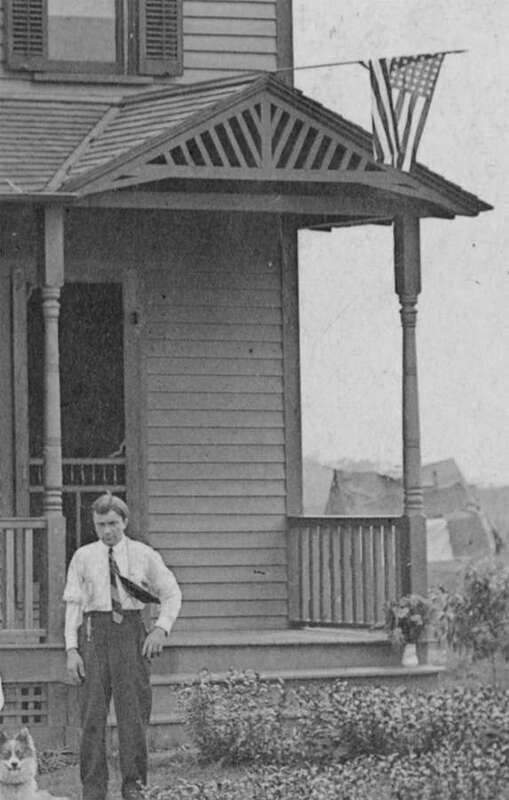 The porch may have been copied from the Sheldon Tavern in Litchfield, Connecticut. This Georgian Mansion is often shown with a winter vestibule in place, but there are four columns supporting the second floor porch. It was a popular source for Colonial Revival designs. That is a definite possibility Gregory K, and Litchfield and Watertown are quite close. The 1868 mansion is stunning inside and out! 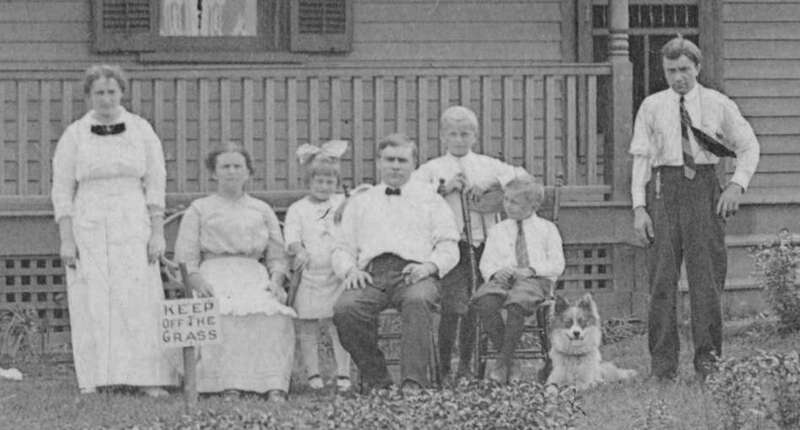 ” It would not be the first time the general public ate and drank on the grounds of 18 Elm St. The ornate mansion, which sits on 4.25 acres, was home to The Hatfield Club in the mid-20th century. The private men’s club had a cocktail menu that included drinks like the Gin Squirt, Sloe Gin Fizz, and Pink Lady with prices ranging from 40 to 60 cents, according to an old and undated menu. It served broiled filet mignon braconiere and brook trout saute meuniere, among 30 or so other entrees. No kidding! I just wish there were more pictures! I have fallen in love with this beautiful 1928 cottage in Goldsboro, NC https://www.zillow.com/homes/for_sale/Goldsboro-NC/78368931_zpid/45473_rid/1800-1940_built/globalrelevanceex_sort/35.533623,-77.729989,35.194292,-78.320504_rect/10_zm/? The parrot wallpaper is crazy, and I love it. I also really like the parrot wallpaper. Another beauty built in 1912 in Rockingham, NC https://www.zillow.com/savedhomes/for_sale/126229790_zpid/1_pnd/36.555981,-75.638123,33.836201,-80.362244_rect/7_zm/1_rs/1_fr/? I’m having trouble getting this link to work – is anyone else having better luck? Yes, I couldn’t get it either! Thank you, Cathy F for the link – I am glad I checked back – this house is unique and very appealing… Thank you, Jeanne, for the share! The Otego, Queen Anne style house has been on the market for a while but appears to be reasonably priced for the features offered. Nice area with picturesque homes and just down the road is an (antiques?) auction house and a deli grocery right next door. With some TLC this fine Queen Anne could shine again. The c. 1840 Evans Mills house is a well preserved example of the Greek Revival. A purist could have some fun with this one and with 5 acres, it should officially be declared as a bargain property. Thanks for sharing. The house in Knderhook… its front entry – with its beautiful stainedglass & alcoves, large entry hall, and staircase are just lovely! All great finds! Upstate NY has some really beautiful old homes. It’s one of the areas I’m looking at for my dream retirement project home. The Queen Anne is super appealing though the Evans Mills property with 5 acres would definitely be hard to resist! The Pulaski, NY house is absolutely mansion grade and unusually intact for a late 1860’s Italianate mansion. To find the original wood cupola finial still being stored is amazing. This is one of the best high end Italianates I’ve seen for sale in a while. The marble mantels need some huge gilded over-mirrors to look complete. I can only imagine what fine furnishings this house once had. I appreciate the share. The interiors have been extensively modernized, in my opinion. There are new mantels, and missing walls and woodwork. That is one exuberant Greek Revival! Oops, that comment was meant for the post above this one! Georgia is my favorite state so I’ve been checking out the listing and found this beauty. Virtually untouched. Just needs to be polished up and I’d be good to go. I love the original cabinets and sink. Nice! It’s got a TON of potential if comeone wanted to restore it back to original. Looks like it’s got many of it’s original light fixtures too. It’s kinda ho-hum on the outside, I almost didn’t look at it. I’m glad I did! I believe the first two properties were (maybe still are) owned by a popular Nashville country music couple. They tried to sell them together for about 13 million a few years ago. They did a great job at restoration and renovation. Guess they are looking for individual owners now. Thanks for sharing. Great houses — I especially like the 1st one, gorgeous library. We were in Franklin a few months ago — it is a lovely town with a variety of shops & restaurants, and well preserved sites of its major Civil War battle. I liked it enough to check out real estate online — unfortunately everybody else likes it too, including Nashville celebs, and prices reflect that. Tennessee itself is beautiful, no matter where you are. Staying close to home, this week, in the Philadelphia suburbs. Rydal, Pa 1950 mid century modern. I’m not usually a fan of this particular style but this one I like! $705,000. Lovely brick Victorian in Lock Haven, Pa (this one is near my daughter’s college!) nice woodwork. $150,000. The Elkins Park home is interesting in that it appears Dutch Colonial revival on the exterior, but enter the home and we are in the victorian era of heavy curtains to close off rooms, furnishings to fit, wall trim, and fire places. I love the furnishings in the parlors and dining room, and the cabinetry in the kitchen. My fav is the kitchen table w/ green chairs and green victorian screen door. Neat. Love that the cottage interior retains its original wood walls, ceiling. The church is beautiful. Love the windows with their Italianate height, decoration, and glass. Am I wrong about the window style in the church? The windows do not appear to be 18th century, but a 1870s or so installation. I love them all the same. The timbers in the church structure are truly something to admire. Early 1900’s “Colonial” in Terre Haute, IN for just under $30K: https://www.zillow.com/homedetails/2415-Locust-St-Terre-Haute-IN-47807/77125763_zpid/?fullpage=true With central heat and air, 3 bedrooms two baths. I would put back Classical/Colonial type columns on the front porch, choose some better exterior colors and this could be a real charming smaller two story house. I kind of feel meh about this one, perhaps just not original/moderne enough for me? But knew some of you would enjoy it. $495,000 in Shreveport, LA. A 1936 Art Moderne with mahogany veneer walls. One woman’s Meh is one man’s OhMehGoodness! Lovely example of the style and I love this! A builder in Atlanta just finished building a series of townhomes in Moderne style – au courant y’all! This was once a fine early 1900’s home with some outstanding millwork inside. But it obviously needs some TLC to bring it back. I would also find the almost $12,400 in annual taxes burdensome but they are not unusually high for the location. I appreciate you sharing. I was just getting this ready to post. Italianate with Classical Revival updates. This listing was just posted on another site and I thought I would pass it on. I recognized the house design as Design No. 105 from the Keith’s Architectural Studies (Minneapolis, MN) planbook. Here’s the design along with floorplans (Internet Archive) https://archive.org/stream/MLKeithKiethsarchitecturalstudies0001#page/n18/mode/1up Nice house with ample photos in the listing. Here’s another example of the Keith design in Muncie, Indiana: https://www.flickr.com/photos/11236515@N05/21834427240/in/album-72157657139234734/ There were published plans available for churches as well. Even mail order architect George F. Barber engaged in Church designs as a sideline to his residential design business. Thanks for sharing. Thank you. You are always excellent with additional information. I really appreciate that. I especially liked seeing the Muncie house as it gave a better look at the design not covered in snow. I would have loved to see the sun porch from the inside it was amazing ! I’m buying a 1930’s home in Angels Camp California. I want to restore it back to original. Many of the original features remain, but have been disguised under carpet and white paint. Any one have any suggestions for paint or a period remodel for the kitchen. I’m so excited to take this home back to original. There is beautiful parquet floor under the carpet in the living room. Right now in all white paint it does not seem to have too much potential. I’ve not seen those built in shelves next to the fire place in another home of the period. Should they be wood? the fire place mantle be wood? the front door wood? I’m ridiculously in love with the bathroom! Any suggestions welcome!! Congratulations! Sweet house with lots of potential. Love the garage-level workshop area too. Thanks, I enjoyed looking at your 1930’s home, Cabusaidi. If you have the time and patience, the Internet Archive has thousands of books in their Building Technology Heritage collection. They can be searched through using various criteria including the date published. You can apply the date filter to only search through those books published say between 1930 and 1936: https://archive.org/details/buildingtechnologyheritagelibrary?sort=-downloads&&and%5B%5D=year%3A%221936%22&and%5B%5D=year%3A%221935%22&and%5B%5D=year%3A%221934%22&and%5B%5D=year%3A%221933%22&and%5B%5D=year%3A%221932%22&and%5B%5D=year%3A%221931%22&and%5B%5D=year%3A%221930%22 The collection is so comprehensive you might even find your home and floor plans in one of these books. They not only have house books but millwork and interior fittings catalogs. Here’s a couple of house plan catalogs, like this 1936 California Homes & Gardens catalog: (small, only 28 pgs.) https://archive.org/details/MargaretAtchleyCaliforniahomesandgardens0001/page/n25 or this 1936 The Home Decorator by Sherwin Williams (color plates showing various rooms as well as colors suggested for furniture) https://archive.org/details/TheHomeDecorator/page/n19 I believe within this collection of period house and building components catalogs/books is enough period information to allow you to take your house back to its 1936 appearance, should you wish to. 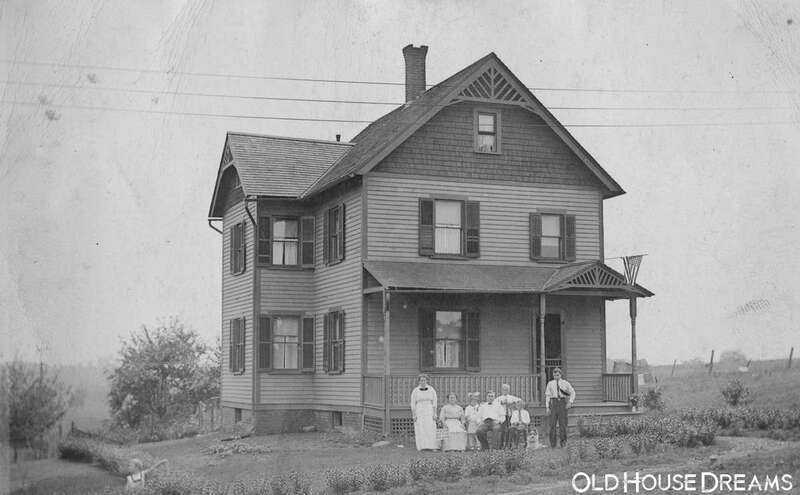 The Old House Journal magazine in recent issues has expanded articles about restoring houses of the 1920’s and ’30’s. (like the June 2018 issue) Until a few years ago, the standard approach for buyers of houses from this era was to gut and modernize them. Perhaps some rehabbers retained a few details from the original period but otherwise they were completely modernized. Now, these homes are old enough to be considered historic and some owners have chosen to keep them authentic to the period. With a vast collection of architectural publications from that period, its not too difficult to discover what was popular in the Great Depression years and restore a house to reflect its original period. As for white paint, as my (late) Grandmother once said to me: “a little bit of white paint can cover up a whole lot of sin”. Chances are, not all of the surfaces in your home now painted in white were originally of that color. Some surfaces may have been clear finished, but slapping on white paint is a quick and easy cover up. Here’s wishing you good luck in your restoration efforts. With the vast amount of available period information and the clues you find in your home, a faithful to the period restoration shouldn’t be too difficult. Please feel free to follow up should you have additional questions. I’d personally enjoy seeing some “after” photos as well as what inspired your restoration. $179,900. Built in 1835, this Colonial/New Englander is located in Brewer, Maine. Not as old as most here, but dang……. “Dang” is right! Love it. Queen Ann Victorian in Summit, NJ with a built date of 1879. It’s listed for $1.65 million. A lovely home but so pricey. I love the website’s collection of homes. Lots of historic pictures to see and some showing the houses as they are now. I need some help finding financing. Building is privately owned but I have to lease the land it sits on from the Railroad. No big deal it’s a 99 year lease at $600 a year. BTW there are no property taxes, zoning, etc because it’s on Railroad land. My problem is I cannot find any financial institution to finance it because it’s on leased land. If anyone has any suggestions or financial institutions you could recommend it would be greatly appreciated. Dan, that sounds complicated enough from a legal standpoint to consult an attorney specializing in real estate law. I think it is possible but not sure if any lending institution would be willing as their guidelines require the lender acquiring ownership in case of loan default. You might also check with the Small Business Administration https://www.sba.gov/ for loan options. (after the government shutdown is resolved) Sometimes loans can be made on inventory and equipment as collateral (UCC 1 type loans) https://www.investopedia.com/terms/u/ucc-1-statement.asp I used to work with UCC 1 documents eons ago when I worked in mortgage banking. A local commercial banker can probably inform you of what is possible. Good luck! Thanks for the info. I do have a few hundred thousand in glass but its only worth something to the buyer. I looked into the SBA but they are closed so that avenue is closed. Have you asked the seller if they would consider seller finance or rent to own ? I would think anyone trying to buy it will run in to the same thing. Good luck. The owner is moving to the west coast otherwise he said he would finance. My first thought is of banks and/or real estate attorneys that are in or near Clayton Georgia. There are several lakes in the area with million dollar homes on leased land (leased from the power company). At least some of those homes must have mortgages and I bet someone up there know how to handle this. Recently renovated and fitted with new kitchen, radiant heat, new floors in laundry room (rest of house boasts original flooring), updated bathrooms, and enclosed wrap around porch. Listing includes house and 11.8 wooded acres. Current owners are only the 3rd owners of the property. “Three Otters” Circa 1830 Greek on 19 acres near Bedford,VA. $600,000. Virginia Historic Landmark. Fabulous views of The Peaks of Otter. Family cemetery on property. Outbuildings. I’ve been by this house many times through the years. Bedford is a beautiful little town not far from Roanoke and home of the Bedford Boys of Omaha Beach fame. This is my first time posting on OHD. I’m sorry if my comment is overkill. This Spanish Eclectic home is flying under the radar in my neighborhood. I am so hoping an OH-lover will fall in love with it, make it theirs, and keep the OH-loving trend growing in Fitchburg! I visited this house while looking for my own home last year, and I was blown away by how intact and beautiful the original woodwork is, plus a lot of other exterior and interior architectural elements. There used to be listing photos that didn’t really show it off at all, but I noticed the owner has uploaded new images and it’s possible to see some of the beauty now. I wish he’d uploaded even more. I looked the home up in Massachusetts’s Cultural Resource Information System (http://mhc-macris.net) and it is not only listed, but is called out by the surveyors: “This is the best example of Spanish-Mediterranean style architecture in Fitchburg. The design of this house is excellent.” The surveyors identified it as Colonial Revival; Spanish Eclectic, but maybe it’s Mission Revival Spanish Eclectic? And the RE listing id’s it as 1910, but I researched it myself (https://www.fitchburgdeeds.com) and I think it’s older, c.1880-1890. Interesting house – thanks! I think it’s more Mission Revival than anything else. The cobblestone foundation and other details put it in the 1910ish period. 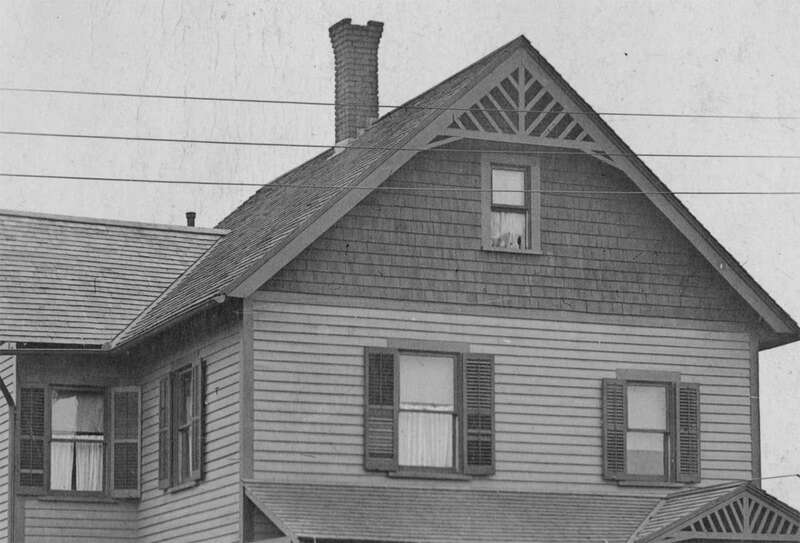 Sanborn maps show a different, older house there before 1900. Directories have multiple renters there before 1912, when coal dealer William M. Powell (1853-1926) evidently bought the property and built the new house. Besides the plastic fence, ceiling fans and can lights, etc., I like it a lot! I had seen an old photo of this house built for a gg uncle of mine, but couldn’t see the pretty detail on the facade. Wish better photos of the foyer. I had no clue that there were some little houses from where I grew up this old! 1863! !